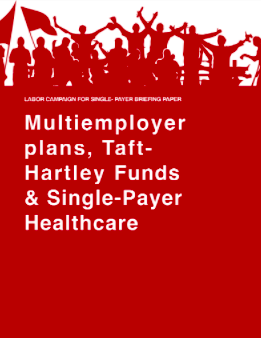 Multiemployer plans -- or “Taft-Hartley Funds” -- provide healthcare coverage for more than 14 million American workers, retirees, and their families. Because they cover so many people and are supported by powerful union and employer stakeholders, questions concerning these plans often influence health reform policy debates and shape organizing strategies. Advocates for single payer healthcare at both the state and federal level are likely to encounter unions and employers who rely on multiemployer plans. Labor Campaign for Single Payer recently issued a briefing paper designed to shed light on this important and unique stakeholder group and help advocates better understand their issues. Advocates share a common vision of healthcare justice with this community and the fight to win healthcare for all will be strengthened with their participation. · What are multiemployer plans and how are they different from other benefit plans? · What stresses are they under and how will the probable repeal of the ACA affect them? · What would be the role of multiemployer plans under a single payer Medicare for All health program? · Ten things that should be addressed when considering state single payer legislation. For a PDF of the paper, click here.